"I love to make this smoothie and then put it in an air-tight container in the freezer. I can scoop out a little and it really helps to satisfy my craving for ice cream." 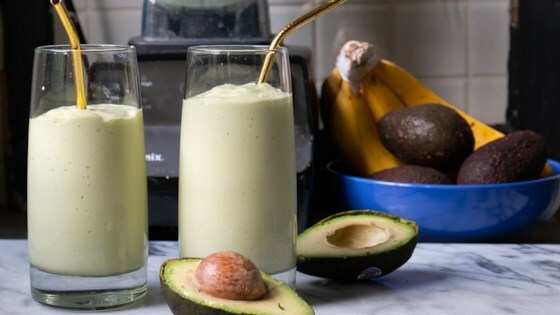 Combine avocado, yogurt, milk, cream of coconut, and ice cubes in a blender; blend until smooth. Please make sure that you use cream of coconut. It is thick like sweetened condensed milk. Using coconut milk or coconut water will dramatically affect the outcome and should not be used. Cream of coconut can be found in your grocery store with the cocktail mixes or with the foreign foods. Add more milk if you like your smoothie thinner, more ice if you like it thicker. I soo love this recipe, I can't get enough of this. I tend to add a bit more cream of coconut and a bit more soy milk. I also added a banana the other day and that was real good too. This is my new favorite smoothie! My husband is still in denial that it has avocado in it.